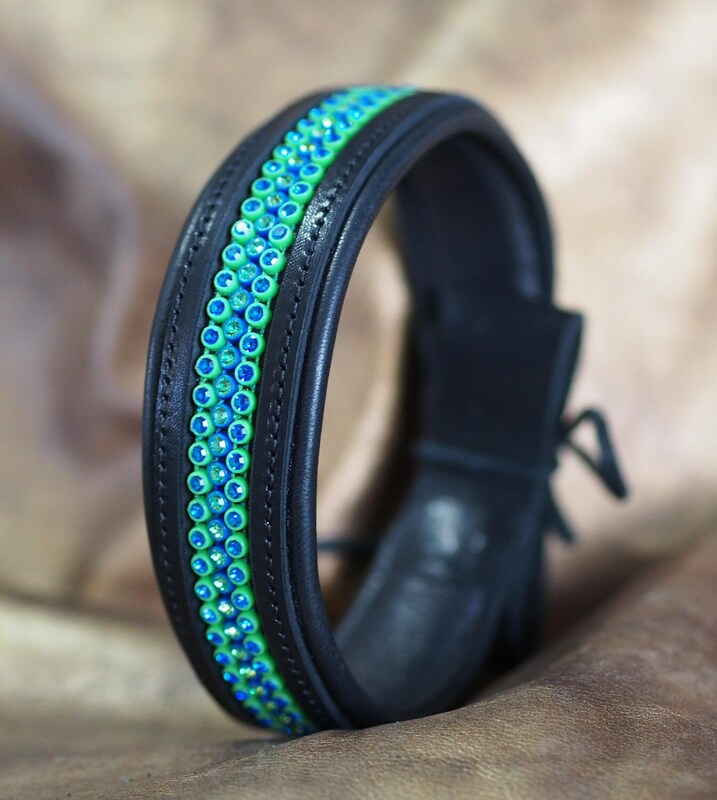 Leather dressage/show brow band is hand crafted in my studio with black cowhide and black lambskin wrapped padded brow liner, with 3 rows of Preciosa Czech rhinestone chain in colors ideal for displaying your love for Seattle's Champion Sounders or Seahawks! 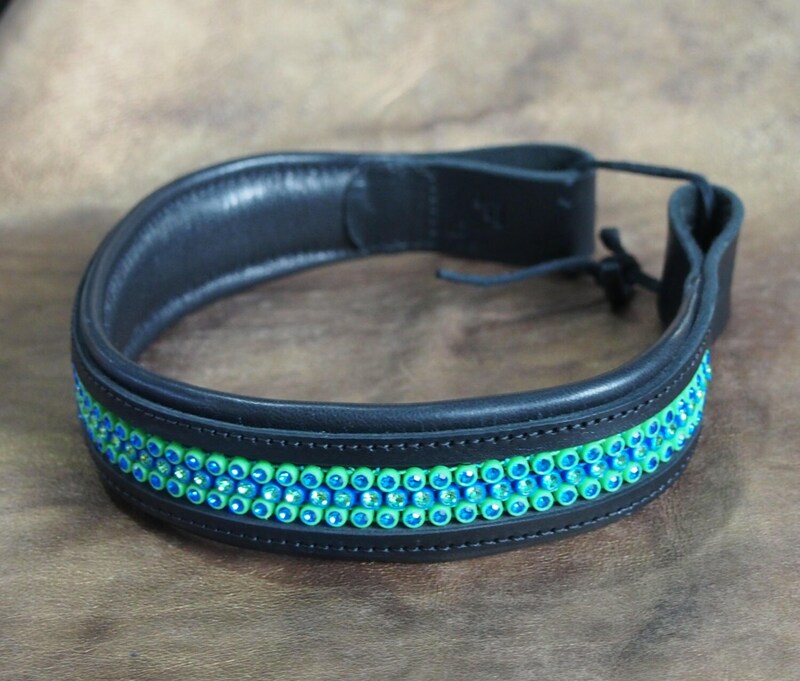 The English tack style band is top quality cowhide, 1" wide with a round-end channel cut 1/2"x 11.5" (for full size as shown, will vary a bit pending selected brow size) to show the three rows of rhinestones within, and all edges of the main band are beveled for clean finish. The Landau water-resistant padding is approximately 12" (for full) and 1 1/4" wide, leaving a reveal on either side of the band to show the lambskin leather, tapering into the main band. 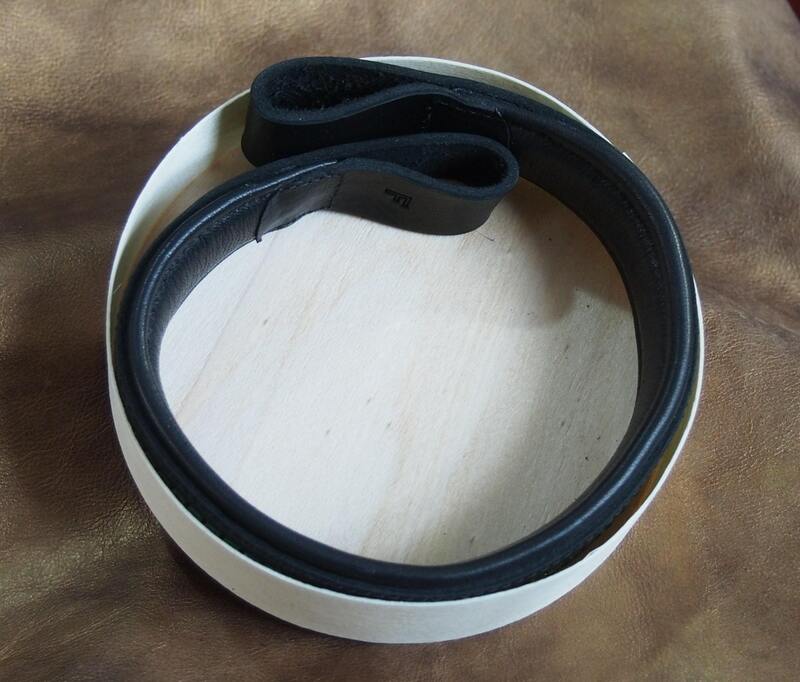 This band has black lambskin, but convo me if you want another color for some contrast. I use plastic banded Preciosa* Czech rhinestone chain, as these not only provide more color on the band, but are tougher and easier to care for than traditional cup and prong style rhinestone settings. And a huge advantage is that there's nothing for your horse's forelock or grooming brushes to catch on, and no prongs that can pull open & lead to lost stones! 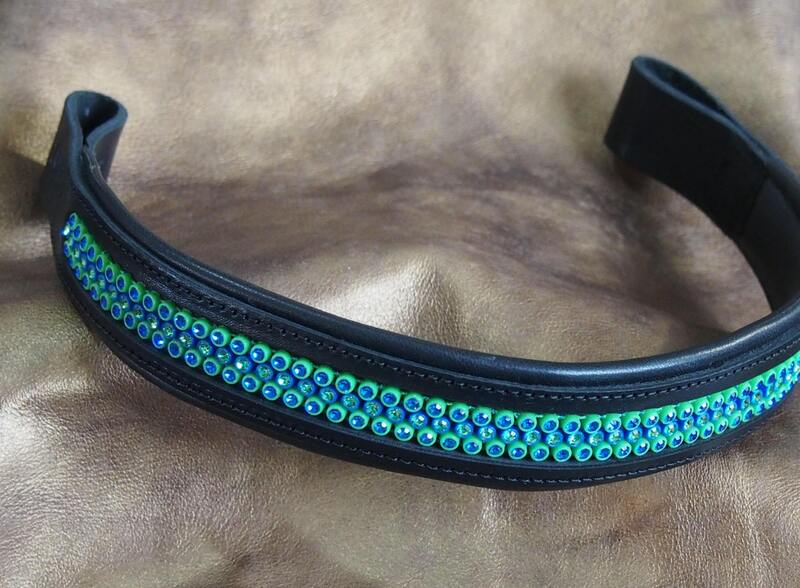 The outer two rows have neon green banding set with sapphire stones, and the center chain has blue banding around peridot colored rhinestones. (Options for other color rhinestone chains will be available on another listing soon). 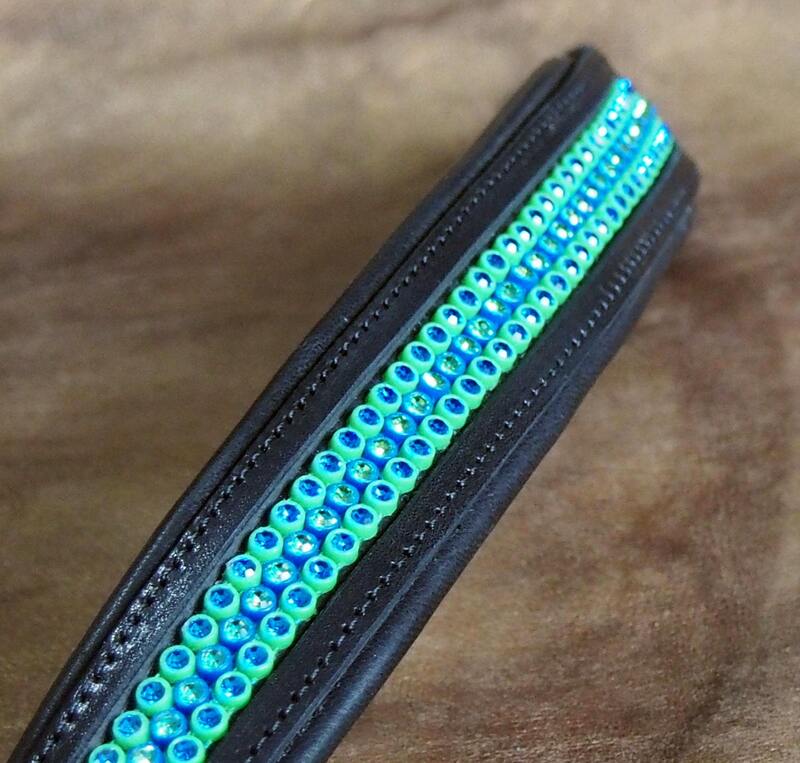 The rhinestone chains are hand sewn to a thin but very strong goatskin using the same nylon thread I sew all my leather with, and the chains are offset against one another to maximize the stones within the channel. They are then glued to the lambskin wrapped Landau closed cell foam padding, and the main band is then glued and stitched to the padding to secure all layers together. The loop for the headstall is glued and secured within this perimeter stitching. The loop end is left open about 1 1/2". If you need to fit a tighter fit for the head stall/bridle, please convo me for a custom order. The loops are stamped with my new division for tack "o:WILBUR", and the size is stamped on the inside. The sizing is based on traditional brow band dimensions for Pony (14.5"), Cob (15 3/4"), Full (16 1/2"), and Warmblood (18"), but customization is always an option if your horse needs another size, as I design and craft these in my studio, I can build to suit your preferences & needs. *Preciosa taught the art of crystal making to Swarovski, who then surpassed his teacher in marketing and branding, but not in quality.